ATI Industrial Automation has introduced a new Compliant Deburring Blade (CDB), its latest and most versatile deburring tool. The pneumatically-controlled, articulated design gives users the ability to tune the contact force to accommodate specific applications by changing the air pressure. The CDB excels in light and medium deburring, chamfering, and scraping operations on materials such as plastic, aluminum, steel, and brass. The robust collet accommodates a variety of readily available blades and media used with hand deburring tools. The blades can be changed quickly and easily -- without the use of additional tools. A simple mechanical design, without high-speed moving parts, makes the new blade an ideal solution for collaborative processes. The CDB's axial and radial compliance is ideal for maintaining constant force where surface irregularities are present, ensuring the highest quality results. 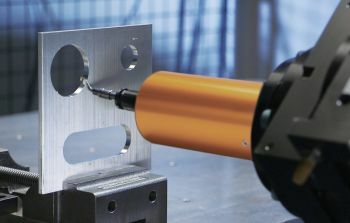 Integrating the Compliant Deburring Blade in a robotic material removal application not only reduces robotic programming time, but also makes the programming process easier. For those looking to automate manual deburring methods, ATI's CDB offers flexibility and reliability that is fast and easy to integrate. A patent on the new CBD is pending. Want more information? Click below. Copyright © 2019 by Nelson Publishing, Inc. All rights reserved. Reproduction Prohibited.